The radiator plays a vital role in cooling a car’s engine. The internal combustion engine ignites an air/fuel mixture to move the crankshaft. In the process, heat is produced. Excessive engine heating can cause damage to some of the delicate engine parts. The radiator uses a mixture of coolant, water and sometimes anti-freeze to keep the engine cool. Water in the radiator can get very hot, and it is not recommended to open the radiator cap while the engine is running. Some years back most cars run on only water in their radiators. The engines where simple and this resulted in less overheating. An engine that runs on water only has a higher chance of overheating and damage to the engine blocks and cylinder heads. Water also has minerals which are transferred as deposits in the engine. It’s always recommended to use the right mix of anti-freeze and water. The minerals also increase the risks of corrosion forming in the engine parts. The coolant-water solution increases the boiling point to around 265 degrees from 212 with water being used alone. The coolant has the vital role of preventing corrosion in the engine block, but you should not overuse it. 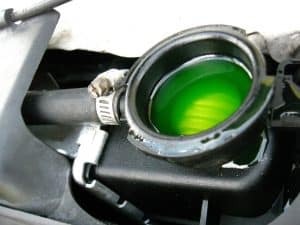 If you live in a cold country which got freezing temperatures – Your coolant/water may freeze if the mix is not good enough, and it may cause some serious damages to your engine. On the car’s dashboard is the temperature gauge that informs you whenever the engine is overheating. Under normal conditions, the temperature gauge should be at the half-way mark. If it rises then check the coolant levels. Use a cloth to open a radiator cap. Most of the caps open through clockwise rotations. Open it slowly and let the pressure and steam to escape from the radiator system. Check the radiator for water levels. If you cannot see any liquid, it could mean that your radiator system is leaking. The rule is to use a 50/50 mix of coolant and water. The coolant has a higher boiling point than normal tap water. It helps to keep your engine cool. If you reside in areas experiencing extremely cold temperatures you may consider adding anti-freeze to the mixture. Close the radiator cap by rotating it clockwise. An understanding of how the radiator works is crucial when you are dealing with water in the radiator. The radiator transfers heat from the hot coolant through a fan. The engine gets extremely hot, and there is a heat transfer from the engine to the coolant and finally the radiator. The radiator in many cars is made from aluminum with thin fins. The radiator inlet allows the coolant to flow through the tubes and the fins dissipate heat with the help of the fan. Radiator fins often have the turbulator which enhances the flow of hot coolant through the radiator. The turbolators helps to regulate the amount of coolant that flows through the radiator tubes. It ensures that the maximum amount of heat is dissipated from the coolant. On the sides of the radiator is a tank called the transmission cooler. The main function of the transmission cooler is to dissipate heat from the oil. This is done through a heat transfer with the coolant. The moment your radiator develops leaks, you will notice water droplets underneath the car. You should notice this when the car comes to a standstill. You should examine all the pipes that flow into and out of the radiator. Check the clamps for looseness. A simple radiator test puts a dye in the water in the radiator. If the dye leaks then you will be forced to replace your radiator. Avoid touching the radiator cap while the engine is running, or immediately you stop to examine it. The radiator produces a lot of pressure, and this steam can cause serious burns. When opening the radiator cap use a damp cloth. With time your radiator may start experiencing problems dissipating heat from the engine. The first culprit when this happens is a faulty thermostat. The thermostat regulates the amount of coolant that goes to the engine. When your engine starts overheating, you will notice that the temperature gauge has risen above the midpoint mark. If you do not address the problem immediately, you will start experiencing further engine problems. If you find yourself constantly refilling the coolant in the radiator, then it could mean you have a coolant system leak. The coolant is characterized by a green or yellow color. Over time sludge develops inside the radiator and this hinders the coolant from moving effectively. Sludge also hinders the coolant from dissipating heat effectively from the engine. There are other instances when the transmission cooler mixes with the coolant. This leads to the development of sludge. The radiator cap keeps the coolant inside the radiator from escaping into the atmosphere. But there is a lot of pressure that is created inside the radiator, and with time the radiator cap may develop cracks. It is estimated that the radiator holds 16 pounds of pressure per square inch. It is the work of the radiator cap to control this pressure. A faulty radiator cap will cause the coolant to flow into the reservoir. This is because the coolant gets released too quickly leading to the reservoir boiling over. Faulty radiator caps cause unwarranted air to flow into the thermostat, heater core and radiator hoses. This prevents the radiator from maintaining a constant temperature, and this results in the engine overheating. Radiator caps are relatively affordable and you should replace a damaged cap immediately. A radiator tester can be used to test the temperatures inside the radiator. The role that the coolant plays in cooling the engine cannot be underestimated. Water is often mixed with coolant at 50/50; you can also add anti-freeze if you live in areas that experience extremely cold temperatures. The reason people do not use water alone in the radiator is that it has a fast boiling point when compared to the coolant. 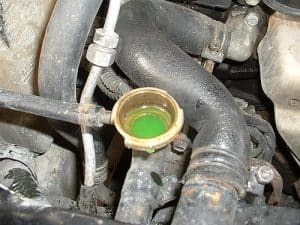 The coolant is a greenish-yellow liquid that increases the boiling point of the water. You should examine the radiator system for leaks the moment that you notice that the temperature gauge has risen above the middle.